1. For efficiency, the work triangle (the space between the sink, refrigerator, and stove) should measure 26′ or less with no single side longer than 9′, or less than 4′. 2. In kitchens smaller than 150 sq. ft., opt for at least 13′ of base cabinets, 12′ of wall cabinets, and 11′ of countertop. 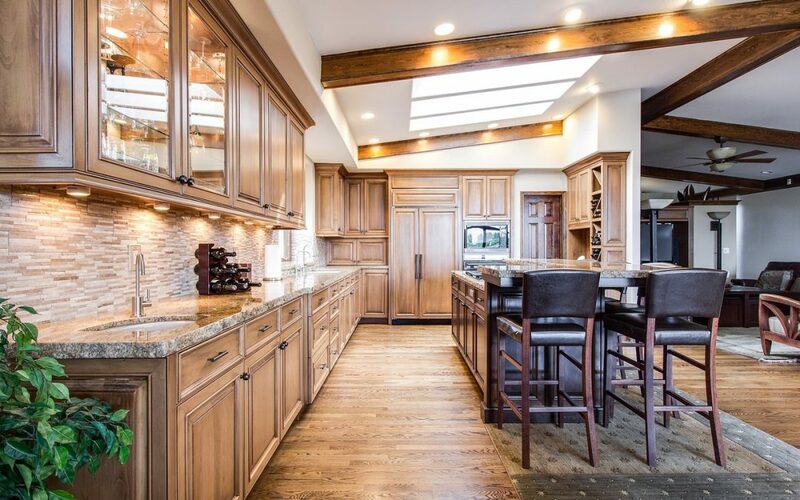 In kitchens which are larger, go with at least 16′ of base cabinets, 15 1/2′ of wall cabinets, and 16 1/2′ of countertop. 3. For convenience, plan work aisles to be at least 42″ wide for one cook, and at least 48″ wide in multi-cook kitchens. 4. Specify a minimum of 24″ of counter space on one side of the sink and at least 18″ on the other. 5. To create the most accessible landing for unloading groceries, allow at least 15″ of counter space on the handle side of a standard refrigerator; on both sides if it’s a side-by-side model. Or include a landing area directly across from the refrigerator, but no more than 48″ away. 6. For cleanup ease, install the dishwasher within 36″ of one edge of the sink and allow for at least 21″ of standing room next to it. 7. For microwaves and ovens, provide at least 15 ” of counter space nearby, at least 16″ deep. 9. For comfort and to help avoid repetitive-motion injury, plan for work counters of different heights; between 28 and 36″ off the floor (easier for chopping and seated-use access), and between 36 and 46″ for general tasks (higher counters accommodate taller cooks). 10. To install a cabinet unit above the cook top, make sure the clearance is at least 24″ for a fireproof surface, 30″ for an unprotected surface.